Once I was back in Germany my concerned mother made me have my blood tested and it turned out that my uric acid levels had sky-rocketed, putting me into a state of pre-gout! At 21! 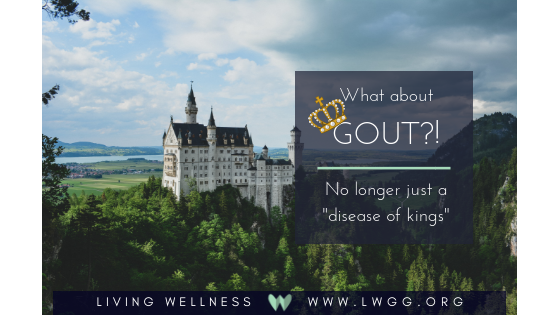 Gout is a pain-filled inflammation-based disease made historically famous by wealthy aristocrats, dubbing it, *The rich man’s disease*. How could this happen to me? I was just a student, nothing close to wealthy! My doctor explained it to me in plain words, “Gout a disease brought on by a bad diet.” Nowadays, the tables have turned; pop is cheaper than well-sourced water. *Fruit* cereal is cheaper than actual fruit. A fiber bar is cheaper than an avocado. It is no surprise then that the incidence of gout has been increasing over the past 20 years in the United States. It turns out that all my life when I thought I was being kept from true enjoyment (pop and fast food) I had in reality been blessed with food that kept me in great health! Because I had bought into the scheme that the “sugar is always sweeter on the other side,” I craved what appeared attractive and once I got it, I got burned! Ouch! What a big old con! I had been tricked. Pop and fast food would confidently present themselves in movies and shows targeted at children-- and lie about the effect they would have on their lives. And what a lie! While the sugar rush is fun in the moment and while fake food can trigger the brain to think it struck gold, following that path will not lead you to candy land. A sense of self-preservation kicked in. I did not want to have gout! While this was not the time I underwent a major overhaul of my lifestyle, it did scare me enough to reform me back to sticking to the foods that I had eaten before I went to Canada. I could have also ignored any common sense of preserving my well-being, and put my faith into the foods I had believed to be *all that* and accept any bad consequences, countering them with an infusion of modern medicine and denial. Crossroad time! My prayer for you this week is that you would consider what are the ways that you can share this kind of love…to yourself. Choose one habit to start or stop doing that will share this kind of love to your own body. You cannot give out of an empty vessel.